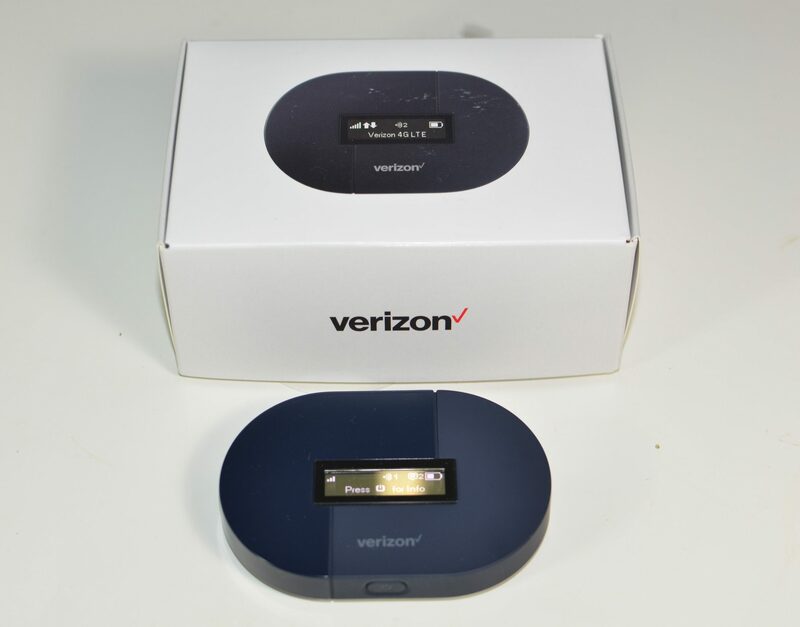 Last fall Verizon started offering a $65 truly unlimited prepaid rate plan that I quickly jumped on, also purchasing the cheap MHS900L Jetpack mobile hotspot pictured above. Let’s just say it wasn’t even worth the $50 I paid for it; several commenters on the initial article warned me of the hotspot’s poor performance and they were absolutely right. I quickly moved to a Novatel 7730L that delivered double the speed or more. But I chose not to spend the money on a new MHS8800L, Verizon’s current highest performing hotspot, because I planned to use the SIM card in boat specific cell-enabled equipment I already had onboard for testing, like the Wave Wifi MBR-550, Shakespeare Webwatch, and Glomex WebBoat (plus a Netgear LB1120). The service from Verizon has been fantastic. 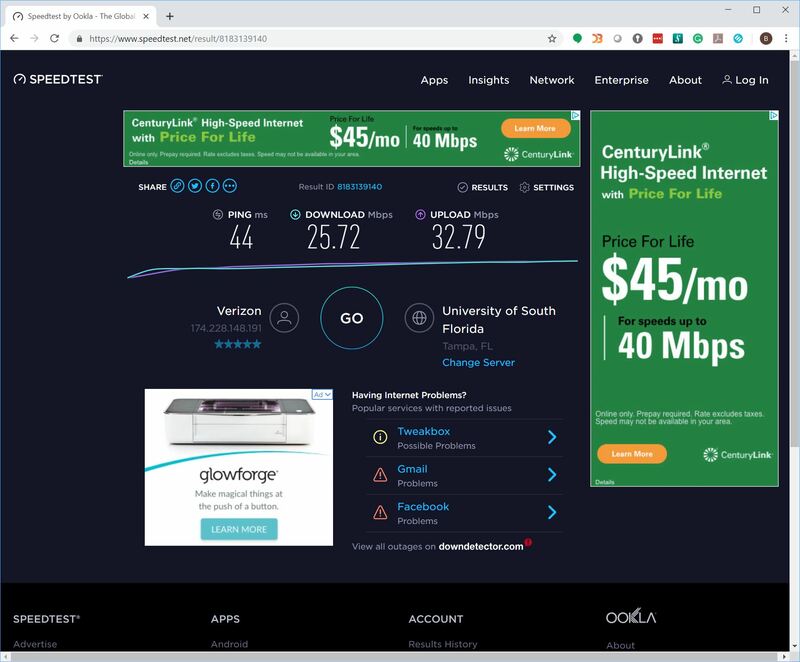 For the $65 a month I’ve gotten consistently good performance — except for a few trouble spots I’ll talk about below — and a thus far a limitless amount of bandwidth. I haven’t been able to track consumption exactly because Verizon’s online usage tracking hasn’t worked for months and also because I keep switching the SIM card into different devices so I can’t rely on any single device’s tracking. But, I do know that I’ve used several hundred gigabytes for months in a row without any signs of slowing down or messages from Verizon. I’ve heard from quite a few people who have tried to go into a Verizon store to buy this service only to be told the plan doesn’t exist or have the rep try to steer them to a different plan. The plan does exist, it is better than any other current plan from Verizon and it’s entirely possible the rep you’re talking to has never heard of it and hence will tell you all sorts of things that are just wrong. The sure-fire way to make sure you end up with the right plan is to reference the internal plan identifier, 28366. The plan should be $70 a month PREPAID and eligible for a $5 per month auto-pay discount bringing it down to $65 a month. I’ve also been using my tried and true AT&T unlimited plan sold through 4G Antenna Shop (4GAS). I’m using a grandfathered $85 unlimited plan that has served me well for over two years now. Sadly, the plan I use is no longer offered but they have several strong options to consider. Each of these plans comes with 35, 75 or 120gb of high-speed data — 4GAS says up to 40 Mbps — and then unlimited data capped between 2 and 5 Mbps. It appears these plans are on the T-Mobile network though I haven’t been able to get confirmation of that just yet. There are quite a few providers of similar plans but I don’t have any hands-on experience with any of the dozen or so a quick Google search returns. Recently AT&T and RV equipment supplier Togo have just announced an unlimited plan for RVs for $360 per year that currently requires using RV specific equipment but might offer some possibilities if you’re willing to experiment. Marina WiFi is the most variable means of getting connectivity and as Ben E. noted, it can be weird. Many marinas, even very high-end and otherwise well-run marinas, have truly terrible WiFi. During our travels, we’ve stopped even trying to connect to marina WiFi unless we see a review that talks about how good the WiFi is or if we see the network is managed by On Spot WiFi. On Spot provides consistently well engineered and built networks with ample connectivity. The two biggest problems that I encounter in marinas are insufficient bandwidth into the marina and radio frequency (RF) congestion. Insufficient backhaul bandwidth is pretty easy to detect. If you notice that weekday performance is great but it slows to a crawl during evenings and weekends, there’s probably not enough bandwidth for the number or users and whatever they’re trying to do on the internet. RF congestion is most often the result of a marina network offering only 2.4ghz WiFi, which can be used by almost all WiFi devices and has very few channels. The few available channels getting so congested they become basically unusable. Steve Mitchell at SailBits does a nice job explaining all the factors that go into designing marina WiFi, and why 5ghz WiFi is valuable. Occasionally I need to download huge files, like a multiple-gigabyte MFD update. I try to connect to WiFi rather than doing these updates on the cellular network and potentially running afoul of carrier traffic management schemes. Every once in a while we find spots where cellular coverage is poor, and sometimes they aren’t in the remote areas where we might expect them. For instance, we recently spent several months in populous Gulfport, Florida — just across Boca Ciega Bay from St. Pete Beach — and found one of those unexpected dead spots. This is an area with plenty of infrastructure around, but for reasons I never did figure out, the marina we were in (a private yacht club, not Gulfport Municipal) had low coverage for both AT&T and Verizon. The marina WiFi was also terrible for most of our stay — On Spot WiFi installed their system at the end of our stay, and the performance increased dramatically — so we had to get creative in search of solutions. Although I’m not sure of all the factors that can influence each cell connection’s performance, I did note that different connections were more effective at different times. This makes a multi-source router a highly useful tool. I’ve been testing the Wave WiFi MBR-550 for a while now — and expect to complete a review in the next few weeks — and it makes switching very easy. 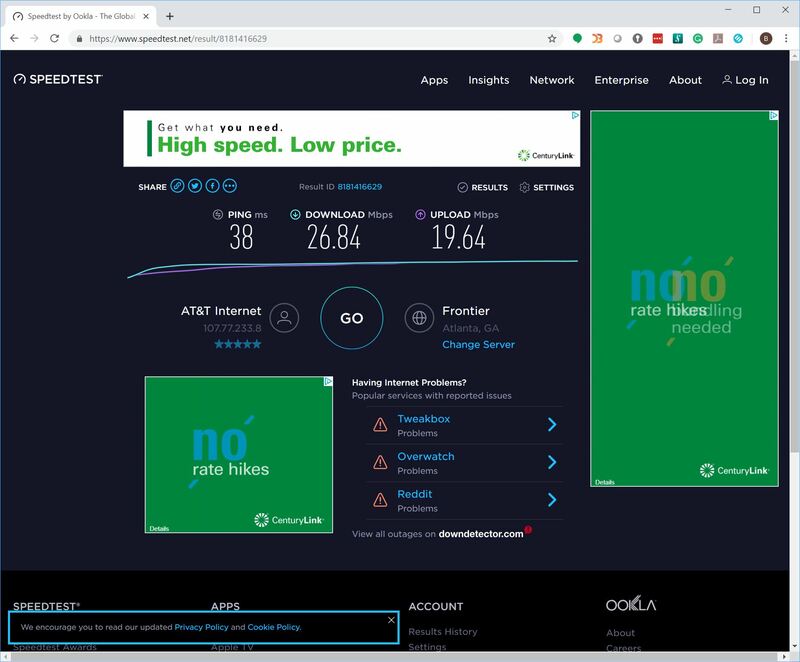 I got into a morning ritual of waking up, running speed tests on each connection and selecting the best performer. Fortunately, I was almost always able to find a connection with sufficient performance. Internet onboard isn’t yet to the level of reliability and performance of a wired home internet connection, but it’s certainly come a long ways from the days when I had a DSL connection run to my slip so I could work on the boat. With our two cellular connections and marina WiFi, it’s the rare exception when we can’t get enough connectivity to work, watch some TV and catch up on the day’s news. I am looking to buy a hotspot and perhaps go with AT&T. I found my T-Mobile carrier is truly dismal off coastal Maine. Marina’s are not dependable and I really like being off the grid, but live by the Ocean Prediction Center and Weather Underground.